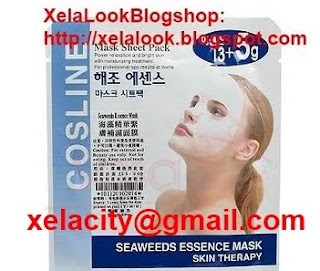 COSLINE Seaweeds Essence Mask contains seaweed essence that promote the carrying of oxygen in blood. Avoid skin loosening by lifting up and flabby facial muscle tissues skin and highlight skin contour. Moisturizes and seals in skin moisture at the same time, which will moisture and luster the skin for longer time. Apply COSLINE Seaweeds Essence Mask on the cleaned face for 20-30mins and rinse off clean.